Looking back on a year ago is the equivalent of reliving a painful psychological beating, and every time I think about something it’s like I’m poking at a bruise. So why is it, then, that Matthias Puech’s A YEAR OF TIME actually forces me to attempt to make peace with the past year instead of continuing to grumble about it? That’s not to say I should reduce the social and political turmoil we’ve all gritted through to mere afterthoughts – anaesthetizing that part of my brain would be foolish. Instead, I think, Puech’s given us A YEAR OF TIME as a form of reset, to meditate the bad vibes away and refresh our outlook before it gets irrevocably coated in psychic grime. 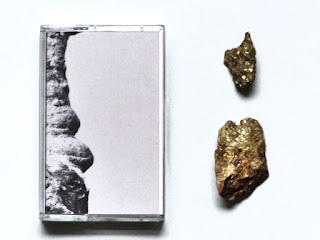 The Paris-based Puech, a “synth designer, programmer, teacher, and researcher” beyond his forays as a musician, splits this tape into four 10-minute “seasons,” with “Spring” and “Summer” on side A and “Fall” and “Winter” wrapping up the tape on side B. Each passage approximates its season in some way: “Spring” mimics melting water and birdsound; “Summer” imagines glacial pools and intensifying heat; “Fall” betrays the emotional ups and downs accompanying the shift in temperature and temperament; and “Winter,” like “Summer,” takes a placid approach but with a more downtrodden tone, broken at times by static blasts that play like icy wind gusts. Each track is an immersive experience, as if you’re transported to the best memory you have of that particular season and are encouraged to relive it repeatedly until the track ends and you transition into the next season. The pacing is gradual and deliberate, forcing you to stop what you’re doing and think about the passage of time in terms of a bigger picture, one where you’re not the most important thing on the face of the planet. That perspective should serve all of us well, as the less inclined we are to be selfish, the better everybody’s situation is bound to be. I could list all the awful junk that’s transpired over the past “year of time,” but it’ll just serve as a reminder of despair and hopelessness. That’s not what you want from me, and that’s not what you get from Matthias Puech. Instead, this tape is a great reminder of the power of introspection and personal healing, getting yourself right before you can truly and convincingly assist others in struggles for justice and peace. These synth excursions exhibit medicinal properties, filling your ears and mind with righteous vibes and good intentions. Internalize that, then point it outward. Let’s make the next “year in time” a whole lot better than the last one. RYNE ZIEMBA "Dirty Sunset #1"